> Urban Beekeeping- Time to keep your own honeybees! There has never been a better time to keep your own honeybees and inner city sites are the best! Why? There are more flowers per square mile within city areas as opposed to the the countryside which is made up mostly of grass meadows, fairly useless to honeybees. To give you an idea, the average countryside beehive can gather approx. 50 jars of honey per year, where as a city beehive can collect approx. 70-100 jars per year. More flowers close by means more honey! So how to start. Begin by gathering as much information as possible on the subject. Read several books, watch DVDs, explore the internet and then sign up for a beekeeping course. The Hive Honey Shop in Battersea run weekend Beginner Beekeeping Courses from their bee farm in Surrey. What makes this course so unique and sought after is each student gets the opportunity to open a beehive and handle live honeybees after the Saturday theoretical module session. Reading about it is one thing, practical hands on learning is always more beneficial. So now you know all about keeping bees, where do you get them from and where do you keep them in a city? There are many professional bee breeders, but even a greater number of rogue amateur beekeepers passing themselves off as ‘bee breeders’. Since the decline in honeybees and a surge in public interest, many people have decided to get involved by keeping their own bees thus helping to maintain our bee population. However as a result in the rise of beekeeping interest, so has there been a rise in those wanting to get in on the act and profit quick. I have never in my 48 years of beekeeping seen so many people offering bees for sale. Where have they come from? Just hobbies beekeepers bumbling along selling unknown swarms or their own mixed mongrel breeds. Bee breeding is a skillful art and the result of careful selective breeding will produce passive, gentle to handle, disease free, good honey gathering bees. My advise is scrutinise the credibility of anyone offering bees for sell. Just because they have been beekeeping for a million years does not mean they are qualified or selling pedigree bees. Yes just like any animal breeding program, breed selection is important and bees are no different. Left to their own devises to free mate they can produce some very aggressive bees, the last thing you need when keeping bees in a tiny terraced garden. This brings me to- where do you put them? The lovely thing about keeping bees is you do not need a big space for them. Bees can fly a distance radius as great as three miles to find nectar, in a city far less. They free fly as they wish so the surrounding area need not be large. You just need about 2 meters distance around your beehive to work and of course free access for the bees to world outside. We keep them on balconies, roof tops, parks, allotments, factory car parks, the attic with a widow open to name but a few! 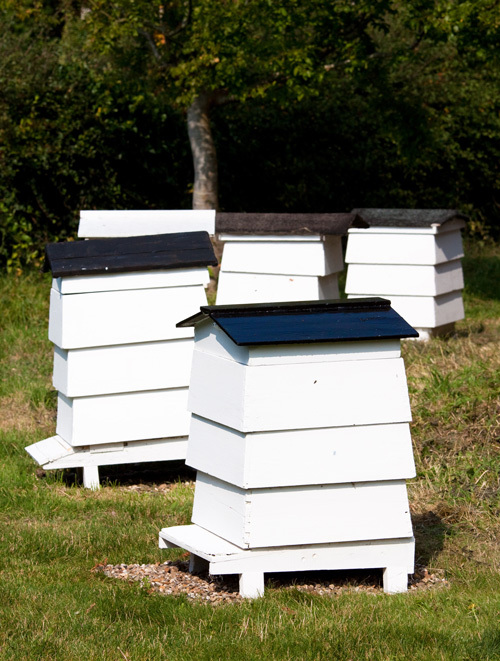 Now many hotels and restaurants in London have beehives on their roof tops gather honey with great success. James our head beekeeper here at The Hive Honey Shop was asked to set up beehives at St James’s Palace for HRH the Prince of Wales. They now have two cottage beehives in the grounds that are gathering the most amazing collection of nectars from all the annual and perennial flowers within Buckingham Palace and the Mall. Recently the press published silly articals suggesting that there are too many people keeping bees in the citys so there will be little food for the bees-nonsence! There are PLENTY of flowers and there is more than enough room for hunderds of new hives. There is a great deal of enjoyment to be gained from keeping your own honeybees, but do not enter this art lightly. Bees require your complete commitment, help and protection. Even though they are wild insects, they no longer are able to cope on their own. So the idea of ‘let them alone beekeeping ‘ is not an option. But for all the hard work and promise of tons of golden nectar, the real lasting affect you will take away will be a new found admiration, love and respect of these little creatures that will stimulate your imagination as you never dreamed possible.